I understand where the concept of deterrent weapons comes from. It has been inbred in us since the first time people with the most advanced or more powerful or more fearful weapons had the advantage in a fight. And, if a people had a superior weapon they could, if desired, maintain their influence over others for a time by threatening to use such weapons. Those times have been with us and our ancestors seemingly forever and therefore part of the human psyche. It is understandable, then, that after we exploded the first nuclear weapon during war, part of our policy to promote peace in the world was the threat posed by having such terrible weapons. This policy did not work. Our policy of nuclear deterrence started a proliferation of nuclear arms. Today there are nine nations with nuclear weapons! 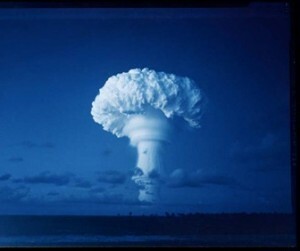 From a high of 37,000 nuclear bombs, there are still over 20,000 at the ready. This too should have been anticipated because it has been a part of human history to try and have equal or better weapons than any potential enemy. So, instead of a peaceful coexistence after WWII, we have been on the brink of nuclear disaster ever since. At times there have been attempts to ban the bomb thru public outcry, or to start the process of the depletion of nuclear stockpiles through treaties. But these efforts have accomplished little. The nuclear powers have held on tight to the nukes and the number of nations that possess them has grown and continues to grow today. And, the peoples of the world still tremble in fear of nuclear war. The continuation of a policy of nuclear deterrence will bring us closer and closer to a nuclear doomsday. The use of nuclear reactors for the production of electrical power is also a threat to human health and the health of our planet. We have only to consider the March 2011 disaster at the Fukushima, Japan nuclear reactor to understand the enormity of devastation such disasters can cause. To review the current status of this disaster, please follow this link.